In mid August I started picking winter squash. I picked up several tiered baskets at yard sales this summer, which I plan to use for storing winter squash and sweet potatoes in the basement. I still don't have that root cellar I've been dreaming of building. Lots of butternut, rampicante (which is also a summer squash, but I've left some in the garden to become winter squash), and delicata. This is the first time I've grown delicata. We roasted some the other night and everyone except Reid seemed to like it. I have some blue hubbard as well, but it will be much too large for my basket system when I bring it in. Last year my winter squash fared quite well in the basement, so I'm hoping this year will be the same. I think this is my first year without growing winter squash. I still have canned butternut so we will have some. Next year I will put out a patch and try the rampicante. I love winter squash - and I LOVE cooking winter meals with all the many beautiful squashes and other root veggies. You have quite a stash awaiting already for your days of preparing healthy meals this coming winter Lisa. I so admire you my dear, you are such a great homemaker! I will admit I have not tasted of any of these squash varieties. They sure are pretty! Great find on the baskets. Squash is top on my list of veggies. You are so blessed to have harvested so many varieties, Lisa! 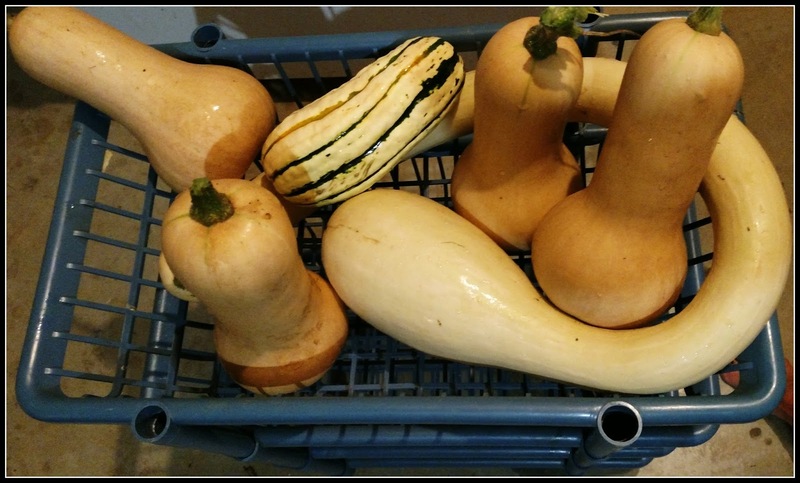 I never knew there are so many different kinds of squash! I have never heard of Delicata or Blue Hubbard. You DO need a root cellar! I have learned more about squash from you than I ever knew before! I like butternut squash. Those baskets look like they will keep the air circulating around the veggies this winter. I just read where someone's family stored potatoes in the basement all winter. I didn't know they'd keep that long (or the squash either). Cool. Your squashes make me so interested. So unique! I hope the taste is good. Not a bad little harvest. I remember when I was younger, my dad grew Zucchini by the bucket load. I'm sure that in time you will get your root cellar. You've always been one of those folks who stay busy but eventually accomplish all their goals. Squash is not a popular vegetable in Ireland. It's not readily available unfortunately. The squash are so beautiful! You did well. Squash is well tolerated by many folks who have sensitive tummies. I like it grilled. Looks like a good crop this year! I'm still trying to get Lewie to eat squash. It's on his list of vegetables he will only try once. Good grief!